Here is our list of best fun things to do in St. Martin - the French side of the Dutch/French island! Soaking up the sun on a tropical island need not be a dream. Visit St. Martin and spend your days with plenty of activities on a tropical beach, snorkeling, scuba diving, sun tanning and relaxing. If you are more adventurous, try some parasailing or windsurfing. If you prefer more classic sports, a game of tennis awaits. Choose one of the best tours in St. Martin and have fun during your vacation here! Cruises, Sailing, and water tours are just some of the great things to do in St. Martin. Set off at dusk and zoom over the crystal clear waters on a powerful jet ski, filling your lungs with warm tropical air. Stop and admire the beautiful sunset while enjoying a glass of bubbly as you drift free on the ocean. Want to spend the day in the sun? No problem! Jump on a jet ski and glide over turquoise waters to some beautiful bays and beaches, including a 5-star hotel, the Belmond La Samanna, where you can enjoy VIP access for the afternoon. Fancy a dip? Grab your snorkeling gear, dive into the water, and spend the day exploring Turtle Reef. You may even meet a turtle or two! 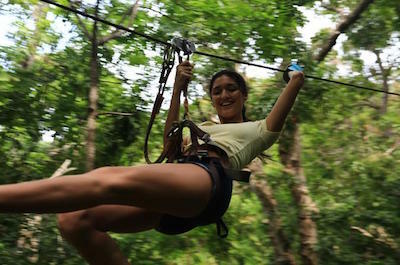 Fly high above the treetops of the tropical forest at high-speed! One thing to do in St. Martin is to visit Fly Zone Extreme at Loterie Farm, where your adventurous side will be thrilled. From zip lines and monkey bridges to tight ropes and ladders, you will be enthralled by this outdoor adventure. To get to your starting point, you will take a ride on a truck up to be captivating observation deck close to the summit of Pic Paradis. Enjoy the magnificent views that surround you, take a deep breath, kick off and begin your high-speed joyride! Game, set, match! Playing tennis, in the tropical sunshine on an exotic island is the next thing to do in St. Martin. No matter what your experience level is, hit the courts with one of the great tours on offer. Grab your partner and some friends, and have a private tennis lesson with a professional instructor. You will work on things like your stroke, tactics and strategy of the game complete with video analysis. Prefer a game on your own terms? 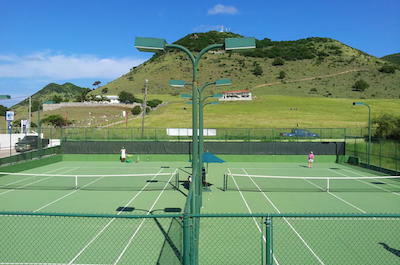 Rent a tennis court and enjoy the game, doubles or singles style, with a bonus of some beautiful scenic views. Take a break from the city and paddle through the beautiful Caribbean waters. 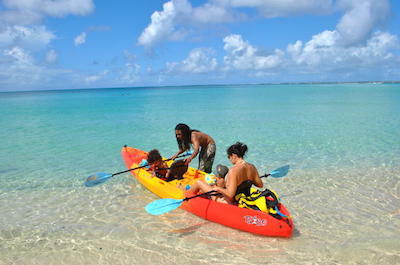 Kayaking and Canoeing are the next sporty things to do in St. Martin. Climb into your kayak and explore the incredible Creole rock, one of the best St. Martin activities, a magical small island in French Marine Park, known as the best snorkeling spot in St. Martin. Jump ship and snorkel in the crystal waters surrounded by gorgeous marine life, including sea turtles. For the more adventurous, grab a canoe and paddle out from Le Galion Beach to the lookout spot, catching loads of waves as you go. An awesome surfing safari, Caribbean style! Soar over magnificent Caribbean beaches with this once in a lifetime, exhilarating experience. 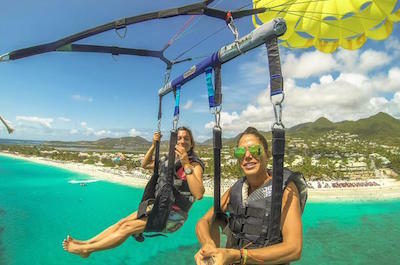 One of the most fantastic things to do in St. Martin is to parasail along the tropical ocean. The fun starts with a high-speed Jet Ski ride to the parasailing boat. Once aboard you will suit up and take flight as you are lifted from the boatÕs parasail platform. DonÕt worry, you wonÕt even get wet! Fly high in the sky alongside native birdlife. Take in the breath-taking views of the Caribbean Ocean and the luxury resorts along the seashore. At your request the captain will 'dip' you into the warm tropical waters, to end off the perfect holiday experience. Go snorkeling, a fantastic thing to do in St. Martin. Grab your snorkeling gear and discover all the gems the tropical Caribbean waters have to offer. Venture, by boat or kayak, to Creole Rock in Grand Case Bay and jump into the crystal clear waters. Explore the incredible seagrass beds riddled with exotic sea life, from spotted eagle rays to peacock flounders. Swim out to the further reefs and spot friendly dolphins and porcupine fish. Head to Turtle Bay and discover magnitudes of marine life that call this reef home. Look out for hawksbill and green turtles and even an octopus if they arenÕt too shy. Paddle back to the shore and enjoy a relaxing well deserved, beach-side lunch. Just dive in! If you have never scuba dived before, this is the thing do to in St. Martin. Diving in the beautiful warm tropical waters and exploring some of the world's most beautiful reefs must be on your bucket-list. 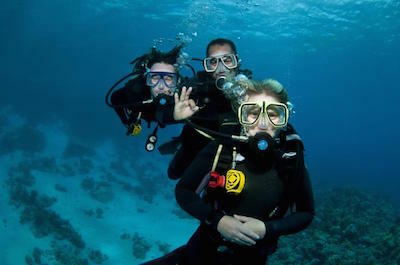 Join the 2-Tank Dive and arrive at the perfect dive spot by speed boat, dive down into the depths of the ocean and explore the Caribbean water-world. Visit two spots during this tour, on the French side and the Dutch side. Be enthralled by unspoiled reefs filled with tropical colorful fish, turtles and even a docile shark or two. You might also come across some majestic sunken wrecks that stingrays call home. Do not forget your underwater camera for this one! Surfs up, St. Martin Style. Surf the great waves of the Caribbean, a really fun thing to do in St. Martin. Start off from Le Gallion Beach in the middle of French Marine Park to an awesome surf spot located at the lagoon. After a quick run-down on the basics of how to catch a wave, head out and ride as many as you can on an awesome inflatable stand-up paddle board! Worried that you might struggle to balance? Climb into a traditional Hawaiian canoe, with two friends and catch some waves Caribbean style. This is a great, feel-good, fun in the sun day out! 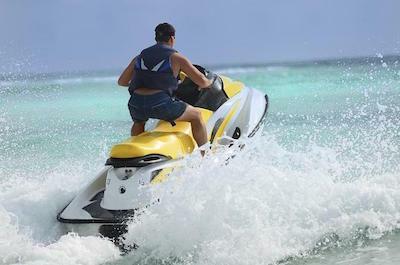 Picture the perfect day zooming over crystal clear waters as you show-off your moves on a jet ski. 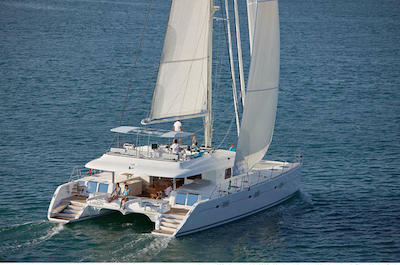 This is the perfect way to experience the tropical waters of the Caribbean. One thing to do in St. Martin is to take some time out, rent a jet ski and discover the unspoiled beaches along the coast. Check out Orient Bay Beach, park your jet ski and soak up some sun. Fancy a little adventure as the sun sets? Depart Marina Royale and visit a few amazing beaches with the option of snorkeling the stunning colorful reefs. Watch the sun take its final bow from your jet ski as you sip delicious champagne right in the middle of the ocean!